This is the first volume of Chris’s autobiography, first published in 1966. It tells the story of his introduction to climbing and his growing awareness that he wanted to spend his life climbing, rather than just assigning it to a spare-time hobby. 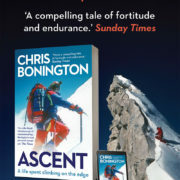 The book ends with the story of the successful ascent of the Eiger, and his departure to Patagonia with his young wife, Wendy. Now re-issued in paperback edition.